A very clever industry incubator is taking shape on the campus of the University of Twente. It’s the latest move by Fraunhofer, Europe’s largest application-oriented research organization. With 72 institutes and research units across Germany and a research budget of €2.3 billion, this network is already making significant impact on many European societal needs. That includes health, security, communications, energy and the environment. 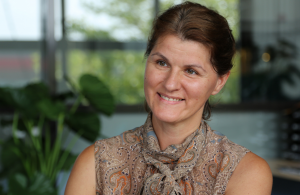 Dr Biba Visnjicki is Director of Business Development at the Fraunhofer Project Center in Enschede. She explained to Jonathan Marks the impact their plans will have on the European Photonics Industry.